Ok, so I am now in Colombia and am absolutely LOVING it!! I have been in the capital Bogota for the past week and will find it very hard to leave as have made lots of really good friends. Vani very kindly put me in touch with one of her friends in Colombia which has been great. Fernando and his friends have been so nice, collecting me from the airport, arranging my accommodation, taking me out to see all the sights, and most importantly introducing me to the Colombian food and drinks! Lots of fiestas every night - its so much fun. Today is the start of a 2 week theatre festival. It is held every two years in Bogota and is a really big event. You can already feel the excitment building on the street as the all the stalls are starting to go up and the parade is getting ready to start in the next couple of hours. Mum - you would LOVE it! Everyone is in fancy dress and there is music and shows and lots of other activities going on. I am really glad that I have stayed to see it. The Espanol is slowly improving. At the hostel there are quite a few locals from Colombia and Equador (my next stop!) on business. The people are SO friendly and kind. For example I mentioned that I liked red wine and the next thing you know they have gone out and bought a box!! We have been teaching each other Spanish and English so its all working really well. Last night we all ended up at a club as one of the guys in the hostel was playing music there. It was really good fun, although my plan to have an early night and more than 4 hours sleep for a change went out the window! Later this afternoon we are heading out to the festival and then have another fiesta planned at the hostel later in the evening which is supposed to finish at 6am...am going to have very sleepy eyes manana! 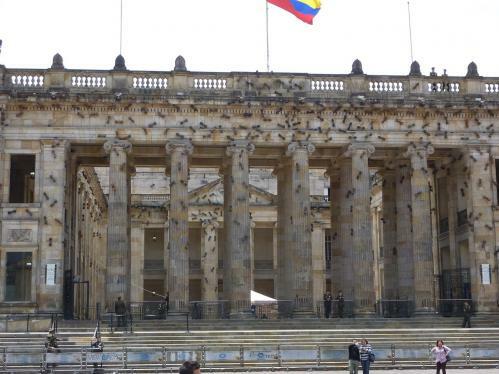 Bogota is a really nice city. I am located right in the middle. To the south you have the old part with beautiful old colonial spanish buildings, hidden cobbled alleys with tiny bars serving an array of drinks including local´indigenous´ liquors - very tasty. There are lots of museums, churches and parks to explore. To the north you have a completely different area. Modern buildings, shopping malls (yeah) and lots of lovely expensive bars and restaurants. Again the buildings and houses surrounding the area are really beautiful. I never thought I would like a capital city so much! Behind all this you have mountains. The other evening I went up to a view point with Fernando and Archie. It was so beautiful seeing the whole city lit up at night over a few beers! Sadly I will have to leave soon as there is so much more to see in this country. I didn´t realise how massive it is. The bus journey to the coast is about 20 hours - rubbish! However there are a few groovy towns to stop at on the way to the beaches so I will be able to break the journey up. Near Santa Marta there is a national reserve so am really excited to visit there and a volcano with bubbling mud in which you can bathe - how exciting!! Steve @ Eghem Cannot believe you have reached South America and you still have enough money for wine! I do wish I was there but will settle for skiing next week! Look forward to the pictures of you in the bubbling mud bath!